Grab your copy of this fast-paced, imaginative fantasy adventure today! Someone has kidnapped a nest of helpless baby gargoyles and is using them as pentagram focuses, devouring their magic—and their lives—for a horrific, illegal power boost. Swept into the dangerous underworld of black magic, earth elemental Mika Stillwater must cobble together her limited resources and skills to have a chance at being the hero the baby gargoyles desperately need. If she fails, the city will be at the mercy of the gargoyles’ murderers and their overwhelming destructive magic. But pitting herself against powerful black-magic villains is proving just as deadly for Mika as for the gargoyles. All earth elemental Mika has ever dreamed of is opening her own store where she can sell her magical creations, she has been saving for months and almost has enough to put down a deposit on a shop in an ideal location, all she needs to do is complete her latest order in time and her dreams will finally come true. Everything changes when a young gargoyle hatchling turns up at Mika's apartment begging for help. 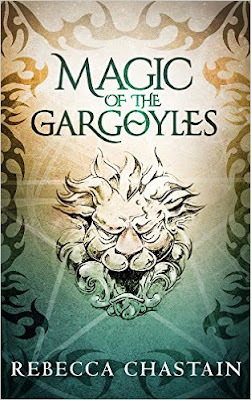 The gargoyle's siblings have all been kidnapped and their lives are in great danger as an unscrupulous magician is siphoning off their life forces to increase his magical abilities. Mika knows that she can't leave the gargoyles to be ruthlessly tortured by a monster but going up against such a powerful enemy will put a target on her back and could end up costing her everything. Most novellas I read tend to be part of a larger ongoing series where I'm already familiar with the world and the characters so I'm instantly invested in the story and it's very easy to dive into them. 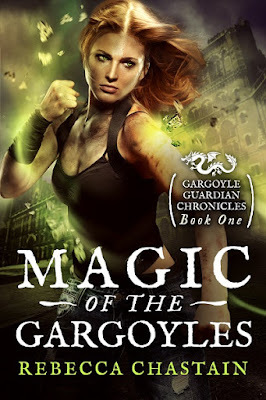 I wasn't too sure how Rebecca Chastain was going to manage to create a whole new world, introduce an entirely new set of characters and create an engaging story in less than 100 pages but after loving all of her other novels I knew I had to give Magic of the Gargoyles a try. Consider me incredibly impressed because she did a fantastic job of all of those things and I enjoyed every minute of this story. Mika is a great main character, she isn't the strongest magic user but she has a lot of heart and she puts herself at risk to protect the gargoyles because they aren't old enough to fight for themselves. You can't fault her bravery and I loved seeing her figure out more about her own skills along the way. I always complain about the lack of female friendships in some stories so I also really enjoyed the bond between Mika and her best friend Kylie, the two support each other 100% and Kylie immediately comes to Mika's aid when she is in trouble. What made this story for me was the gargoyles though, they were utterly adorable and each of the siblings had different quirks and characteristics that made them stand out as individuals. I'd quite like a family of baby gargoyles to move into my house actually, they would make life interesting for sure! Magic of the Gargoyles is a fantastic little novella full of action and adventure and a very well built world considering how short it is. There is plenty of room for the story to be expanded upon and I'd love to read about more of Mika's adventures so I was very excited to discover that Rebecca Chastain is already at work on another 2 stories in this world. I'll certainly be buying any new instalments on release day and I can't wait to spend more time with Mika and the gargoyles!